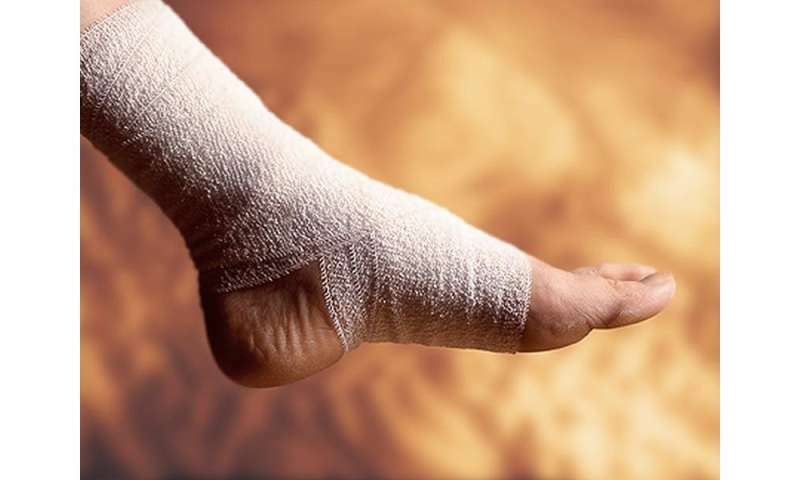 (HealthDay)—There does not appear to be a clinically meaningful association between baseline or prospective hemoglobin A1c (A1C) and wound healing in patients with diabetic foot ulcers (DFUs), according to a study published online April 16 in Diabetes Care. Betiel K. Fesseha, M.D., from Johns Hopkins University in Baltimore, and colleagues retrospectively evaluated the association between A1C and wound outcomes in 270 patients with 584 DFUs over a study period of 4.7 years. The researchers found that baseline A1C was not associated with wound healing in univariate or in fully adjusted models. In the participants with baseline A1C <7.5 percent (hazard ratio [HR], 2.07; 95 percent CI, 1.08 to 4.00), no association with wound healing was seen with the mean A1C change from baseline. A nadir A1C change of 0.09 to 2.4 (tertile 3) was positively associated with long-term wound healing versus those with a nadir A1C change from baseline of −0.29 to 0.0 (tertile 2) in this group. For participants with baseline A1C ≥7.5 percent, neither nadir A1C change nor mean A1C change were associated with long-term wound healing. "The paradoxical finding of accelerated wound healing and increase in A1C in participants with better baseline glycemic control requires confirmation in further studies," the authors write.